Refresh your spirit and escape to Villa Provence. Your own French Provincial haven, just an easy two hour drive from Sydney. 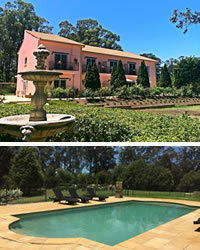 Set in the heart of the Pokolbin vineyards in world famous Hunter Valley wine country. We have nine elegant and spacious suites, set on twenty picturesque acres. Where your peace and serenity are guaranteed without compromising your expectations of comfort and enjoyment. Why not sip champagne by the pool, sit on your private balcony and see kangaroos graze, as you drink a chilled glass of chardonnay from the vineyard next door, and watch the spectacular sunset over the Brokenback Ranges?